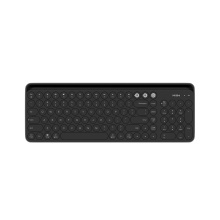 The MIIIW BT Dual Mode Keyboard made of alloy material, is equipped with BT and 2.4GHz Dual Mode for smart sensitive use, and its ergonomic use angle-6°is designed for relieving your finger fatigue and good reading angle also provided by the soft bracket, greatly improve your working speed. The dual mode connecting technology, just press the button of 2.4G/BT, to switch the different devices connected. The bracket fits smartphone or phablet size, comfortable reading angle provided. Support mainstream system, and suitable for Windows, Mac, Android, iOS(iPhone and iPad). The bottom part of keyboard adopts high-end Aluminium Alloy material, and it goes through precise pressure and CNC cutting process. Ergonomic angle can relieve your finger fatigue of long-term use. 104 exquisite keys designed on the keyboard, greatly improve your input efficiency.